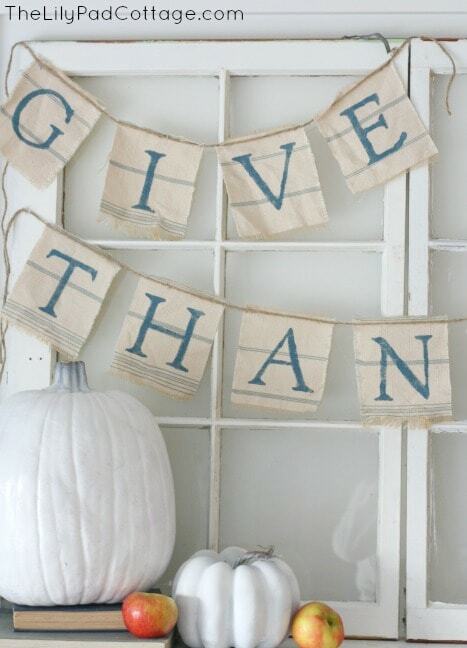 Have you seen my Thanksgiving Mantel? 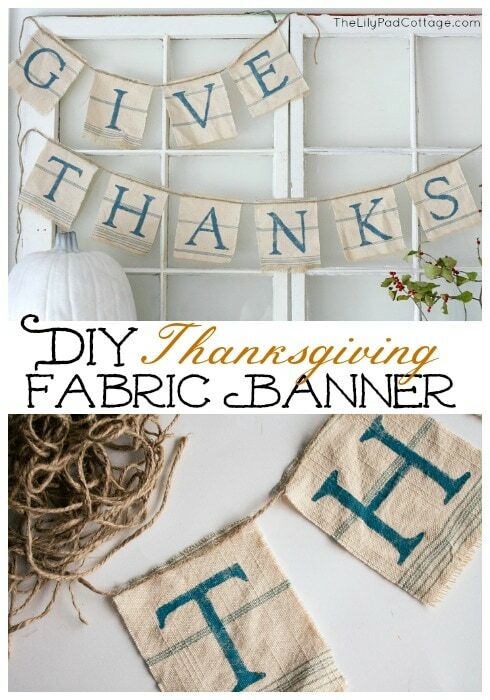 I made this cute Give Thanks banner for it and totally got swept up in my hitch hiking story from Thanksgiving past that I didn’t give you any details on how to make your own! Let me fix that, and clue you in to the easiest little banner tutorial ever. 1. First find yourself some scrap fabric in your craft closet (if you are like me it all comes flying out at you when you open the closet door, just choose whatever hits you in the face first) I happened to have this fabric leftover from my DIY upholstered bed project. 2. 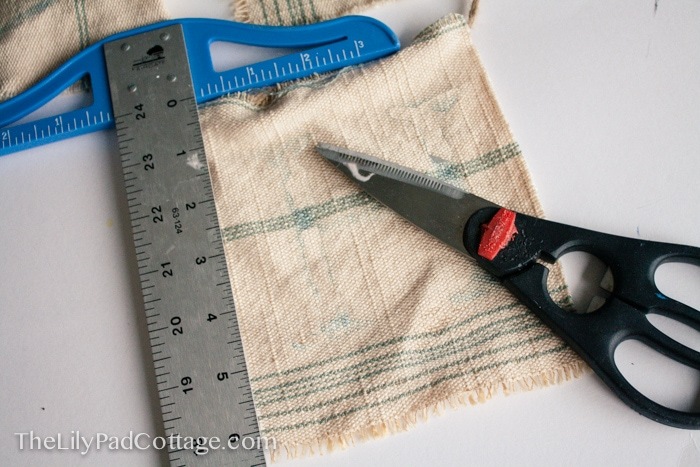 Cut your fabric into rectangles, I made mine about 7 inches by 5 inches. This fabric is a little like burlap (which would work well for this project) and frays in a pretty way so I pulled some of the threads out on all the sides. 3. Grab a stencil, I have a bunch (again crammed in the far reaches of my disaster of a craft closet) but most are pretty inexpensive I think I got the one I used at Hobby Lobby (50% off of course!) for around $5. 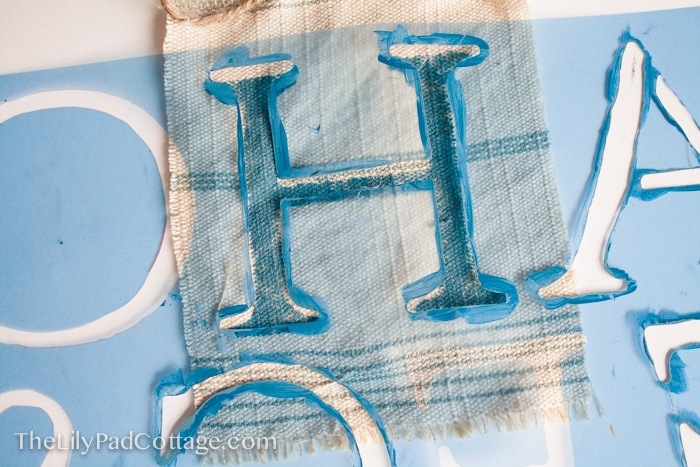 Just use regular craft paint and carefully stencil on your letters. Let dry. 4. 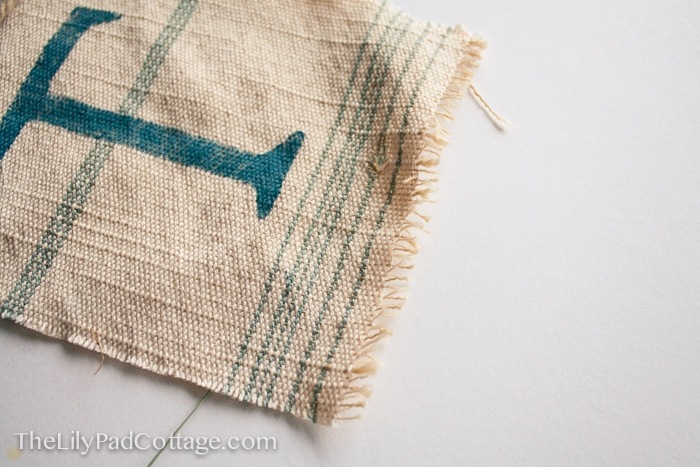 Determine how long you want your banner and cut a piece of twine to that length. I spaced mine about 1 inch apart. Then I just hot glued two little dots in each corner of the fabric. Done! You can check out the full Thanksgiving Mantel here. See totally easy right? and completely free if you have everything on hand like I did. 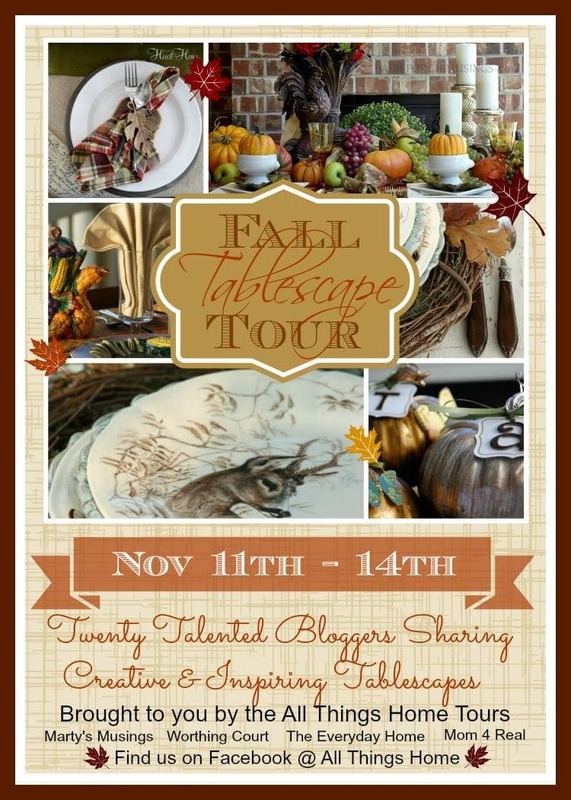 Hope you all have a great weekend, I’ll be back next week participating in another Thanksgiving tour – this time Tablescapes! Love the mantel. Keep going back to it. Thanks for the banner tutorial. It seems pretty easy. Can’t wait to tour all the tablescapes. You see, I’m an addict to tableware. I lost count of the number of patterns I have. You have a craft closet, I have a tableware one! Lol! I’m sure it looks like Santa’s workshop in your house right now. You have such great ideas, Kelly. Can’t want to see your home dressed up for Christmas! Have a great weekend! Thank you so much for the tutorial! Love your banner. Have a great weekend. So easy and so beautiful! !